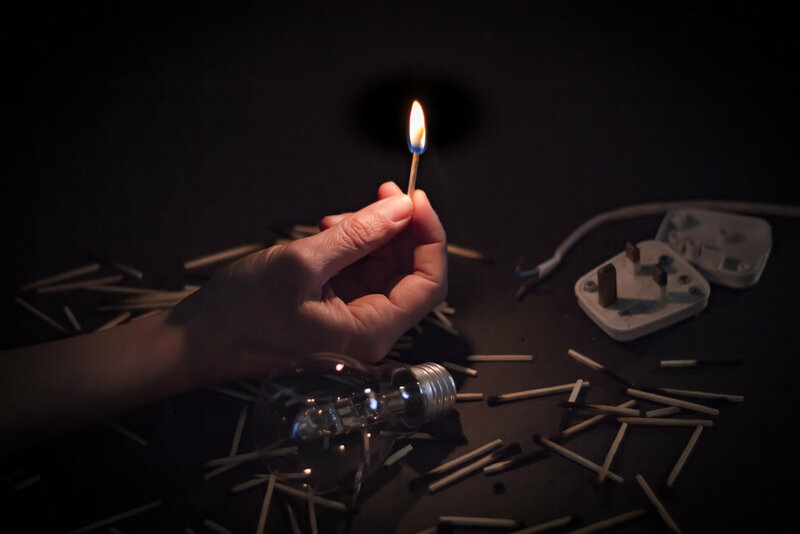 In a totally dark room, a performer will attempt to construct 40 electrical lights in 4 hours using only match light as they connect bulbs, wires and plugs. When each light is finished it is plugged into a socket that is operated by an electrical timer switch. After four hours the switch will activate and the space will be illuminated. The illumination correlates to the performers success and ability to perform the task. Darkness denotes a failure of the task. Gillian is a Glasgow based performance practitioner. She makes rigorous attempts to build and control her environment over hours, and sometimes days, by undertaking physically demanding and mentally exhausting durational performances. Gillian’s interest lies in the fleeting moment where her will to succeed meets her diminishing physical ability to complete each task. Adam is a scientist, games designer, typesetter, comic artist, film-maker and Visual Artist. His practice reflects each of these disciplines, often combining them to create novel areas of exploration, using his background in creating scientific investigations as a starting point for artistic explorations and methodologies. Together, their practice seeks to explore the notion of ‘the imagined ideal’ through subjective performance, objective experimentation, documentation and observation.